Born in Annville, Jackson County, Kentucky, Akeman came from a musical family. He was taught to play the banjo by his father, James Roy Akemon. He got his first real banjo when he was 12 years old in exchange for a pair of prize bantam chickens. Akeman began playing at local dances and gained a reputation as a musician, but the income was not enough to live on. He joined the Depression-era Civilian Conservation Corps, building roads and planting trees. Eventually, he entered a talent contest judged by singer-guitarist-musical saw player Asa Martin. He won and was invited to join Martin’s band. During an early appearance, Martin forgot Akeman’s name and introduced him as “String Bean” because of his tall, thin build. Akeman used the nickname the rest of his life. Akeman originally was only a musician, but when another performer failed to show up one night, he was used as a singer and comic. From then on, Akeman did both comedy and music. He appeared on WLAP-AM in Lexington, Kentucky, and played with a several groups in the late 1930s. Akeman also played semi-professional baseball. It was as a ballplayer that he met bluegrass pioneer Bill Monroe, who fielded with another semi-pro team. From 1943 to 1945, Akeman played banjo for Monroe’s band, performing on recordings such as “Goodbye Old Pal”. He also teamed with Willie Egbert Westbrook as String Beans and Cousin Wilbur, a comedy duo who appeared on the same bill as Monroe’s band. When he left Monroe, he was replaced by Earl Scruggs, a banjoist with a very different style. In 1945, Akeman married Estelle Stanfill. The same year, he formed a comedy duet with Willie Egbert Westbrook, and they were invited to perform on the Grand Ole Opry. The following year, Akeman began working with Grandpa Jones, another old-time banjo player and comedian. Jones and Akeman worked together at the Opry and years later on the Hee Haw television series. They also became neighbors near Ridgetop, Tennessee. Akeman became a protégé of Uncle Dave Macon, one of the biggest Opry stars. 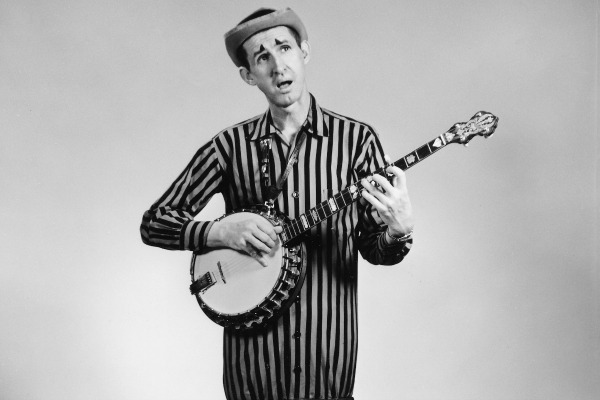 Near the end of his life, Macon gave Akeman one of his prized banjos. 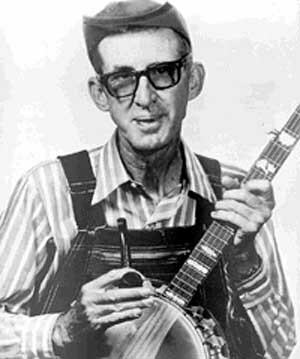 Akeman, by now known only as Stringbean, was one of the Opry’s major stars in the 1950s. 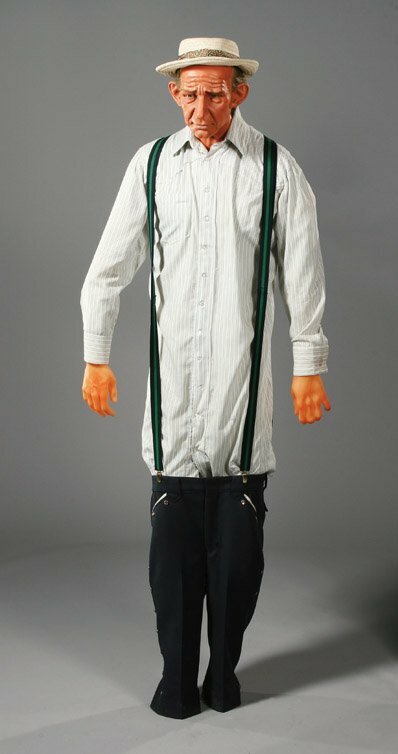 He adopted a stage costume that accentuated his height—a shirt with an exceptionally long waist and tail, tucked into a pair of short blue jeans (from Little Jimmy Dickens) belted around his knees. This made him look like a very tall man with very short legs. The costume had many antecedents, including Slim Miller, a onetime stage comedian said to be Akeman’s inspiration. 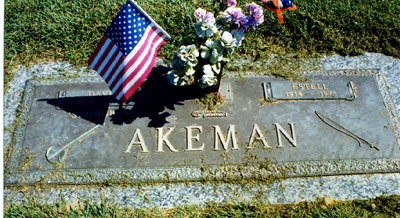 Akeman did not record as a solo artist until the early 1960s, when he was signed by the Starday label. By then Earl Scruggs, Akeman’s replacement in Bill Monroe’s band, had become the leading figure in banjo playing, especially among younger listeners. Scruggs-style three-finger picking became the predominant style copied by country and bluegrass banjo players. However, Akeman and Grandpa Jones remained the most celebrated performers of the old-fashioned banjo playing, “clawhammer” or “frailing.” Akeman’s skill is still admired by fans of the original banjo styles. Akeman is listed with Uncle Dave Macon, Grandpa Jones, and Ralph Stanley as the greatest old-time style banjo pickers. Akeman kept his audience with his traditional playing and his mixture of comedy and song. He scored country-chart hits with “Chewing Gum” and “I Wonder Where Wanda Went”. Between 1962 and 1971, he recorded seven albums. 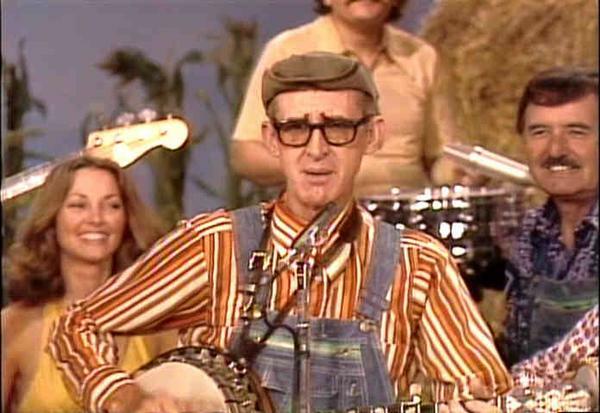 The first, Old Time Pickin’ & Grinnin’ with Stringbean (1961), included folk songs (especially humorous animal songs), tall stories, and country jokes. Akeman was a star at the Grand Ole Opry for as long as he lived. 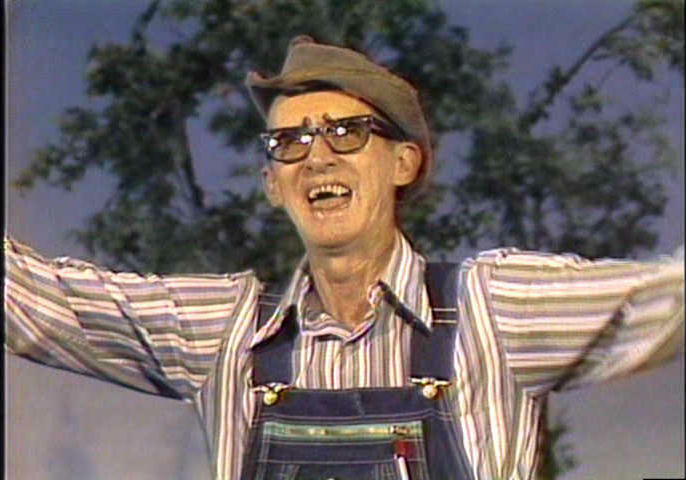 In 1969, Akeman and Grandpa Jones became cast members of a new television show entitled Hee Haw. One of his regular routines was reading a “letter from home” to his friends. 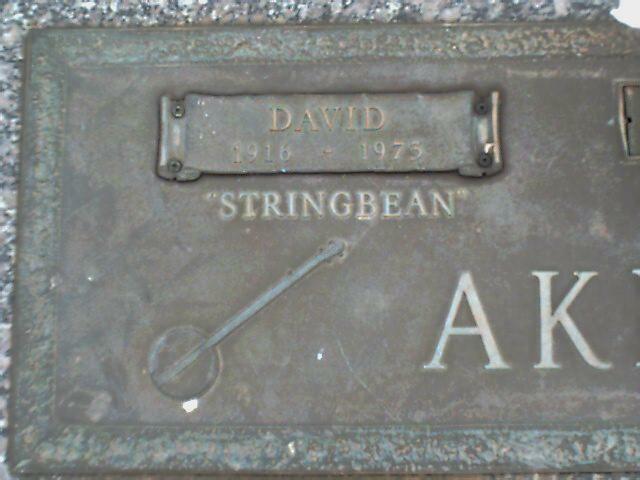 Asked about the latest letter, Stringbean would take it out, saying he carried it “right next to my heart”. Not finding it in his overalls pocket, he would check all of his other pockets by patting them with his hands until he found the letter, usually in his hip pocket. He was also the scarecrow in a cornfield who would say one-liners before being shouted down by the crow on his shoulder. Hee Haw continued airing his taped segments following his death and his final episode was season 5, episode 26 which aired on 23 March 1974. Akeman was modest and unassuming, and he enjoyed hunting and fishing. Accustomed to the hard times of the Great Depression, Akeman and his wife Estelle lived frugally in a tiny cabin near Ridgetop, Tennessee. Their only indulgence was a Cadillac. Depression-era bank failures caused Akeman not to trust banks with his money. Gossip around Nashville was that Akeman kept large amounts of cash on hand, even though he was by no means wealthy by entertainment industry standards. The killers took only a chain saw and some firearms. In 1996, 23 years after the murders, $20,000 in paper money was discovered behind a chimney brick in Stringbean’s home. The money had deteriorated to such an extent that it was not usable and had to be turned in to a bank. Marvin Douglas Brown fought his convictions in the appellate courts. On September 28, 1982, the Tennessee Court of Criminal Appeals affirmed the trial judge’s order denying him a new trial. Marvin Brown ultimately granted an exclusive interview to Larry Brinton of the Nashville Banner. He admitted his part in the burglary and murders, but insisted John Brown fired the fatal shots. As Marvin Brown, by his own admission, had committed burglary (a felony) that resulted in death, Brown was legally guilty of murder, regardless of who fired the shots, under the Felony murder rule. Marvin Brown died of natural causes in 2003, at the Brushy Mountain Prison, in Petros, Tennessee, and is buried in the prison cemetery. John Brown is incarcerated in a Tennessee Special Needs Facility. In July 2008, theTennessee Parole Board deferred any parole for 36 months. He was again denied parole in July 2011. The A&E cable television network profiled the case on a 2003 episode of its City Confidential series. David and Estelle Akeman are buried in Forest Lawn Memorial Gardens in Goodlettsville, Tennessee. During the remaining production of Hee Haw, the scarecrow was left as a memorial. Bluegrass artist Sam Bush recorded “The Ballad of Stringbean and Estelle”, which tells the story of their murders, for his 2009 album, Circles Around Me.